Denver Air Connection has announced an interline agreement with United Airlines. DAC, offering commercial passenger service between Sheridan County Airport and Denver International Airport since November 2015, will begin working with United in early 2019 to offer connectivity to more than 300 destinations across the United network. Fly Sheridan for convenience today. Earn points for savings tomorrow. We know you have a choice in how you travel, and we value your choice to Fly Sheridan. As a way of showing our appreciation for your use of local air service, we’re excited to announce launch of our new loyalty program, “Jump On Board Rewards”. Through this program, every time you purchase an eligible fare and travel with Fly Sheridan, you earn award points that are automatically deposited into your Jump on Board Rewards account. Once you’ve accrued enough points, you can redeem them for a free one-way ticket on future Fly Sheridan travels. How many points you earn depends on the type of ticket purchased, as it is calculated on the base fare price you purchase. Getting started is as easy as creating a Jump on Board Rewards account with us the next time you fly. The program is open to all passengers, whether it’s your first time flying with us, or your hundredth! For more information on accruing points, redeeming points, and applicable blackout dates, please see our Jump On Board Rewards page. Family vacations are a hallmark of summertime activities, and now Fly Sheridan is making them easier on your bank account. Children ages 2 – 11 at the time of travel are now discounted off select fares when traveling with an adult (Blackout dates apply). Of course, saving on the tickets means more money for souvenirs, adventures, or maybe even an extra “kids-only” activity at the destination to give you parents a vacation within a vacation. Book your flight today at www.denverairconnection.com! *Other Restrictions: Fares shown are available at www.denverairconnection.com. Fares are subject to change until purchased. Tickets purchased through Denver Air Connection’s call center (866-373-8513) incur an $8 booking fee. Seats are limited and may not be available on all flights, especially those that operate during very busy travel periods or holidays. Fares include all carrier-imposed surcharges and government-imposed taxes and fees. Tickets are non-refundable and non-transferrable. Cancellations/changes incur a $50 fee plus increase in fare, where applicable. Denver Air Connection flights are public charters sold through Charter Alliance Group LLC and operated by Key Lime Air as direct air carrier. These charter flights are subject to Department of Transportation Public Charter Regulations. First checked bag is $20. Second checked bag is $35. Third checked bag and thereafter is $100 per item. Overweight/oversized/extra baggage is subject to additional charges. 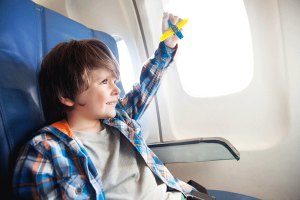 Accompanied children ages two through 11 (at the time of the travel) may purchase the applicable Child Fare for the flight. Proof of age will be required at the time of travel. If you are traveling on a ticketed Child Fare, you must present the traveler’s proof of age (i.e., birth certificate, passport, or another government-issued photo ID that indicates the ticketed traveler’s date of birth) to a Customer Service Agent at the airport in order to check in for your flight. Passengers who cannot provide acceptable proof of age will be required to purchase a regular adult fare at the current available rate. Round-Trip Jet Service Now Serving Sheridan and Johnson Counties! Nothing beats Sheridan and Johnson counties when it comes to quality of life, and reliable air service is an important piece of that quality. Whether it’s for business or personal travel, being able to fly from an airport near your home means less time getting where you’re going and more time being there. Passenger air service is once again operating out of Sheridan, Wyoming, with a new company, a new service schedule and new fares. This exciting opportunity brings Key Lime Air, dba Denver Air Connection, to the table as Sheridan and Johnson Counties’ partner in providing local air service. If you’re ready now, don’t wait! You can book your flights online, and don’t forget to check out the schedule page and other travel information in preparing for your trip. Next time you’re planning a trip, remember to Fly Sheridan!